For some reason I have been thinking about pizza these past few days. While I don’t really like pizza, I will eat it when offered to me. There’s not much food value in the basic recipe—unless the tomato sauce is counted. Tomato sauce, like all sorts of things made from tomatoes is supposed to help your heart. 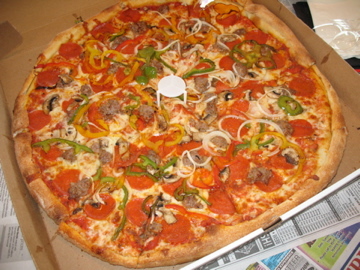 Of course, if you eat a pizza with mushrooms, vegetables, and anchovies, you will have a meal with some food value, but by and large, pizza is not a desirable meal by itself. The first time I ever heard of pizza was right after World War II in California. After the war, my father was transferred to California and soon after we all went to a county fair. I had never ever been to a county fair before. It was glorious. All sorts of displays—a big TV was displayed and we watched the World Series on it. There was a food trailer that had a sign proclaiming “Pizza Pies” were for sale. I bought a slice. Liked it. I didn’t eat another one until the next year at county fair. Once, years later, I walked a long distance to eat in an Italian restaurant that had an extra good—in my estimation—pizza pie. I went there twice. Early in marriage, we made pizza at home—if you can call it pizza. We bought a box of Chef Boyardee pizza mix; it came with flour, some sort of tomato sauce, and parmesan cheese. We even bought a round pizza pan. It was okay. Much later in life, my family and I were “secret” buyers for Domino’s Pizza. We were required to order a pizza once a month. Then call Domino’s headquarters to describe our experience with the order—were they polite? Did the pizza arrive in 30 minutes or less? And, did we enjoy the pizza? There might have been other questions, but I don’t remember. Now-a-days, we buy frozen pizza. There’s D’Giorno pizza, Tony’s Pizza, and some others that have an Italian sounding name. The names for pizza I don’t get are Red Baron (a German World War I flying ace—really?) and Tombstone (either it was Wyatt Earp’s favorite or it is as hard as a tombstone when cooked). Anyway, that’s what I have been thinking about recently—pizza.